When visiting the Dexter Shores area you will find many opportunities for outdoor recreation and activities. Listed below are some of the parks available for use. Contact Dexter Shores for more information on what is available in the area. 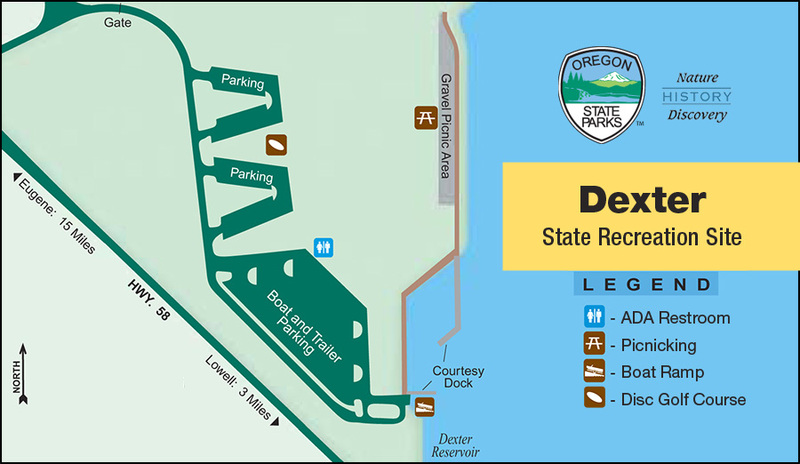 The east end of Elijah Bristow State Park is home to Dexter State Recreation Site, picnicking and boat launching area. 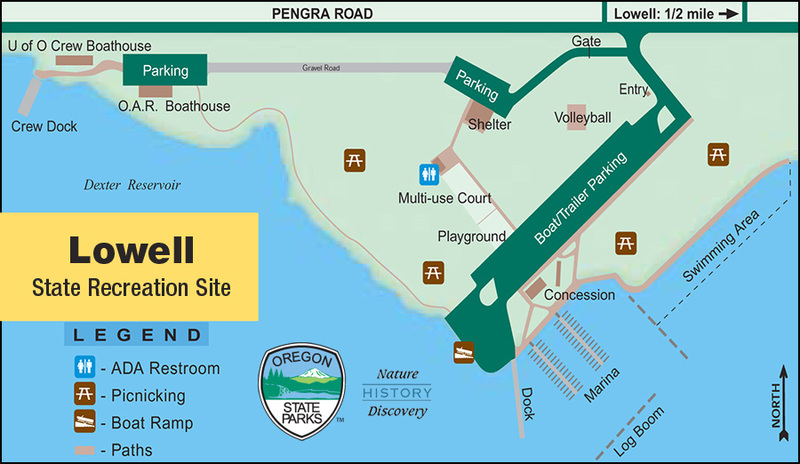 This 100 acre parcel with spectacular views of the Cascade foothills offers boat/trailer parking for 70 vehicles, a restroom (no water) and a trail that connects to Elijah Bristow State Park to the west. Area anglers know the park as a great place to fish for small and large mouth bass, crappie and trout. The lake is a popular spot for sailing as well as powerboat activities. This lake is not drawn down as the other Lane County Lakes are. There are no standard fees associated with this park. This small but beautiful park is a great place to take a break. The park, which you get to by crossing over the reservoir at the covered bridge at the Lowell turn-off from Highway 58, is packed with features and amenities: a basketball court, volleyball, reservable picnic shelter, a playground, towering oaks, good fishing, swimming area and of course, boating, boating, boating. There is no fee to use this park unless you want to reserve the group picnic area. The shelter holds up to 150 people. 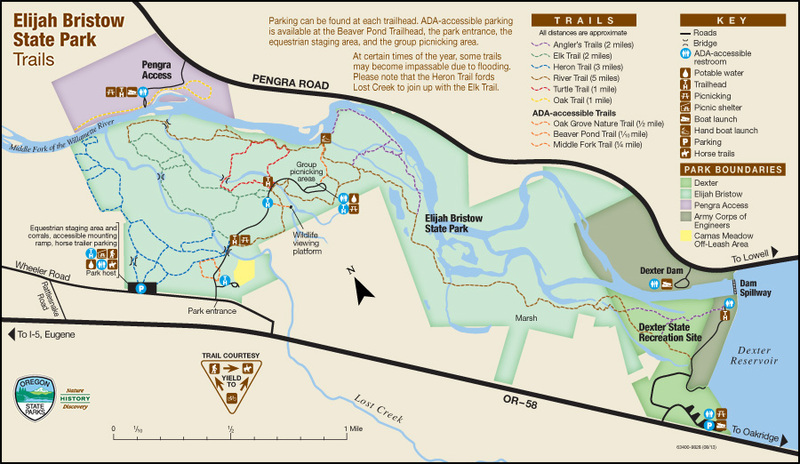 The River Trail is part of the Eugene to Pacific Crest Trail system that starts in Alton Baker Park in Eugene and ends at the Pacific Crest Trail near Oakridge. All trails are shared use, except the one-mile pond loop, which is for foot traffic only. Trailheads are located at different points in the park and can be accessed from the day-use parking lot and picnic areas. Dexter Disc Golf Course was built in 2001 by EDGC volunteers. It’s a challenging but fair test of discgolfer skills. 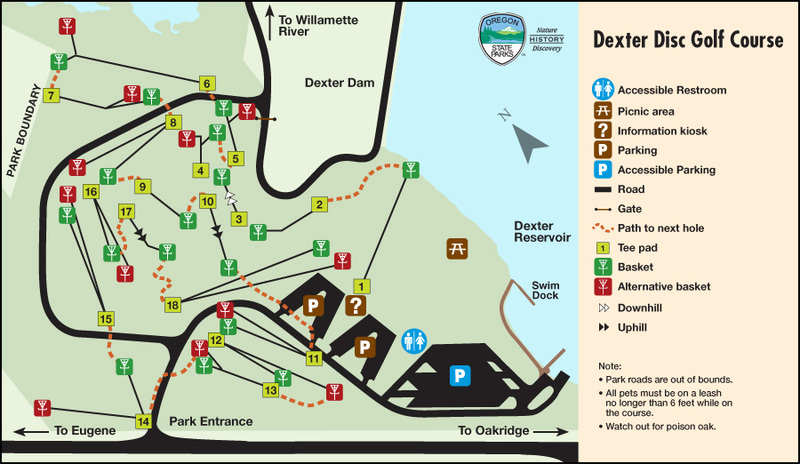 The 18-hole disc golf course winds its way through oaks and Douglas fir trees and you can reach nearby Elijah Bristow State Park through a system of connecting trails that follow the Middle Fork of the Willamette River. Information for this page gathered from the Oregon Parks & Recreation Department at oregonstateparks.org.